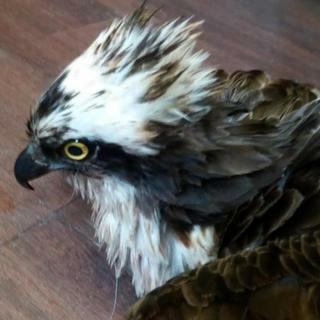 An osprey tangled in a fishing line which was found in the grounds of an animal rescue centre in Aberdeenshire has had to be put to sleep. Staff at New Arc near Ellon initially mistook the injured bird for an empty paper feed bag last month. The fishing line - tangled round its neck and wing, and down its throat - was removed. However, staff said the 17-year-old osprey's initial progress unfortunately did not continue. A spokesman said: "At 17 he was already an elderly chap and we were very aware that even in perfect health Ollie might not have survived his annual migration to Africa to return next year to raise another family, but we wanted to give him every chance to do so." "We called the vet back in to assess his condition, although we knew that he had basically given up the fight."